Crowned by the iconic twin peaks of the magnificent Pitons – a UNESCO World Heritage Site – St. Lucia is the beauty queen of the Caribbean. An island of spectacular natural splendour, the immensely beautiful island is blessed with a splendid combination of sandy beaches, crystal-clear waters, rugged mountains, lush rainforests, cool rivers, refreshing waterfalls, bubbling sulphur springs, natural harbours, gorgeous bays and pristine coral reefs. The scenic coastline is dotted with pretty fishing villages and quaint towns. St. Lucia possesses a natural beauty that is bound to remain – development is heavily regulated with specific protections for its rainforests, estuaries and marine reserves. The fusion of British, French and African Carib heritage is reflected in the life of the island today, including its architecture, culture, music and food. With a dramatic topography, a laid-back lifestyle and friendly, easygoing people, St. Lucia is considerably less developed than most other Caribbean islands and retains that quiet Caribbean charm. That means that for lovely beaches and nature, relaxed yet vibrant authenticity and low-key international sophistication, St. Lucia is hard to match. Nearly 340,000 visitors came to the island in 2014, an increase of more than 6% from a year earlier. The island enjoys a flourishing tourism industry and welcomes those eager to take in its breathtaking beauty and unique cultural heritage. And experience shows that real estate buyers will most likely start off as tourists to the island, fall in love with it and, later on purchase a St. Lucia property. Several highly regarded hotels and spas, two state-of-the-art marinas, a challenging 18-hole golf course, a modern shopping mall and great restaurants have enticed regional and inter-national property buyers to invest in St. Lucia’s real estate. Adding to the island’s great quality of life and standard of living, St. Lucia also boasts a busy calendar of events – the Caribbean Twenty20 cricket tournament (January), Nobel Laureate Week (January), St. Lucia Jazz & Arts Festival (May), St. Lucia Carnival (July), Creole Day (October), Oktoberfest (October), and the Atlantic Rally for Cruisers (December). Property prices in St. Lucia remain favourable for buyers, and the island is increasingly seen as one of the world’s most attractive property markets. St. Lucia is in many ways comparable to neighbouring Barbados, but its prices can be up to 50% lower for comparable homes for sale. Most buyers of luxury property in St. Lucia come from the United States, Canada, the UK and the European mainland. St. Lucia is also considered one of the most modern and efficient islands, with a history of political and economic stability. The island gained status as an independent member state of the British Commonwealth in 1979, and has a constitutional monarchy with the Queen as sovereign. The legal system is based on English Common Law and the Code Napoléon. The highest judicial body is the Privy Council of the United Kingdom. There are no restrictions on foreign nationals purchasing real estate in St. Lucia, and its currency is pegged to the USD, reducing currency risk. Global accessibility to St. Lucia is excellent, with direct flights from New York, Miami, Boston, Atlanta, Montreal, Toronto, Manchester and London. St. Lucia’s government is extremely committed to its continuing growth as a luxury destination, and has recently introduced the Citizenship by Investment programme to stimulate investment in St. Lucia’s real estate market and economy. The island will accept applications for citizenship by investment. To qualify, an investment in St. Lucia, as well as a net worth requirement, will be required. An investment in an approved real estate project comes with a minimum threshold of 300,000 USD. The property must be owned and maintained for a minimum of five years. Property registration, processing fees and taxes must be paid in addition to the property purchase. Applicants will also be required to demonstrate a minimum net worth of 3 million USD to qualify. Moreover, citizenship by investment in St. Lucia is exclusive, as the grant of such citizenship is limited to a maximum of 500 per year. As a citizen of St. Lucia, one may hold dual citizenship, so there is no requirement to renounce one’s citizenship of any other country. Moreover, a St. Lucia passport allows for visa-free travel to over 90 countries, including the Schengen Area (26 European countries), as well as visa-free travel within the Caribbean Community (CARICOM), plus all other rights to which CARICOM nationals are granted under the Revised Treaty of Chaguaramas. St. Lucia’s Citizenship by Investment programme is definitely expected to add further attractiveness for buying a second home or holiday home on the island. The market for these second passports is growing amongst high net worth individuals, especially those who come from countries where their passports are subject to restrictions. They like the ability to conduct business in major markets without such restrictions. As the most naturally beautiful Caribbean island, St. Lucia epitomises the essence of the Caribbean’s easygoing, understated lifestyle. The island is fast emerging as the destination of choice for Caribbean real estate investment, holiday homes and retirement living. 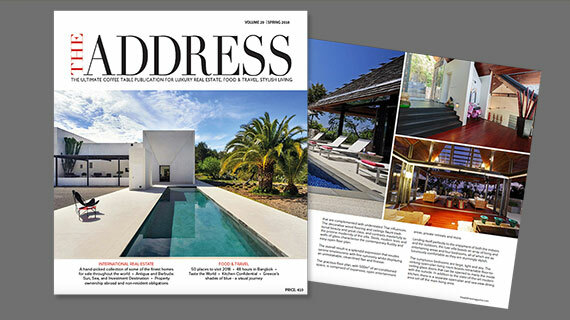 Explore more St Lucia real estate for sale in THE ADDRESS Magazine.